Lupona caryatid stools, thrones, or seats of leadership, (also called kipona or kihona in some sources) are considered the most important of all Luba royal insignia of office. Used solely by Luba rulers, lupona stools are a visual representation of royal Luba power. Sacred Luba knowledge and history is transferred to Luba kings during four stages of initiation exercises that each ruler must past through before he is installed. At the end of the fourth and final stage, called Lukasa, the king emerges to be sworn into office. He sits on the lupona stool, which is placed on leopard skin. Upon installation, lupona stools are no longer considered thrones but are instead said to be 'seats of power' or receptacles that hold the spirits and memories of the current, and deceased kings and chiefs. They are also said to be mnemonic maps of clan migrations, territories and premises of Luba kingdoms. After the installation of the king, the stool is rarely brought out (only during very special ceremonies). When not in use, it is wrapped in white cloth, stored in a secret location outside of town, and guarded by a designated official. The Luba trace royal lineage through the female line—female royals often marry chiefs from neighbouring kingdoms to extend rule and political influence. In addition, the Luba believe that women are uniquely positioned to support leaders in ruling their kingdoms. 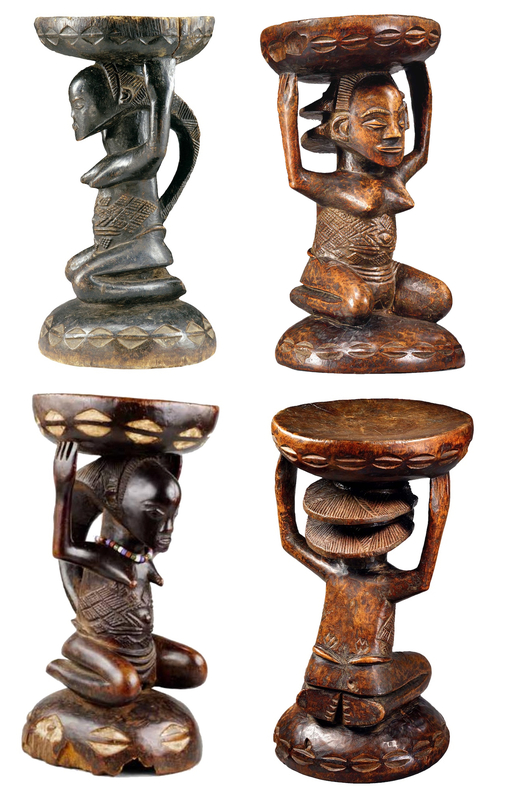 As such, many lupona stools depict female ancestors 'supporting' the seat, acknowledging their important roles in Luba society and the fact that the ruler sat on the stool inherited his power from his female ancestors.